The streets of La La Land run red when Jennifer Blood returns to declare a new war on the mobs... or does she? As a low-level hood plots to leverage her in a bid to take over the Los Angeles underworld, her war attracts some very dangerous attention and unexpectedly sets a lethal international chain of events in motion. A deadly new direction from writer Steven Grant, the The streets of La La Land run red when Jennifer Blood returns to declare a new war on the mobs... or does she? As a low-level hood plots to leverage her in a bid to take over the Los Angeles underworld, her war attracts some very dangerous attention and unexpectedly sets a lethal international chain of events in motion. A deadly new direction from writer Steven Grant, the acclaimed writer of The Punisher and creator of 2 Guns! Collects the complete comic book storyline from Jennifer Blood: Born Again #1-5. A deadly new direction from writer Steven Grant, the acclaimed writer of The Punisher and creator of 2 Guns! 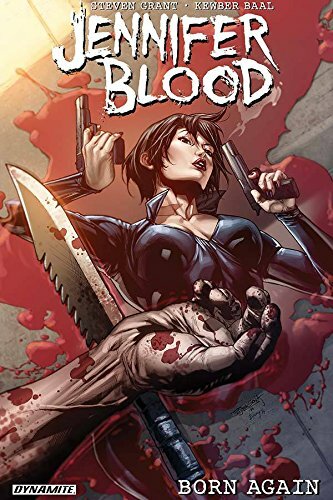 Collects the complete comic book storyline from Jennifer Blood: Born Again #1-5.